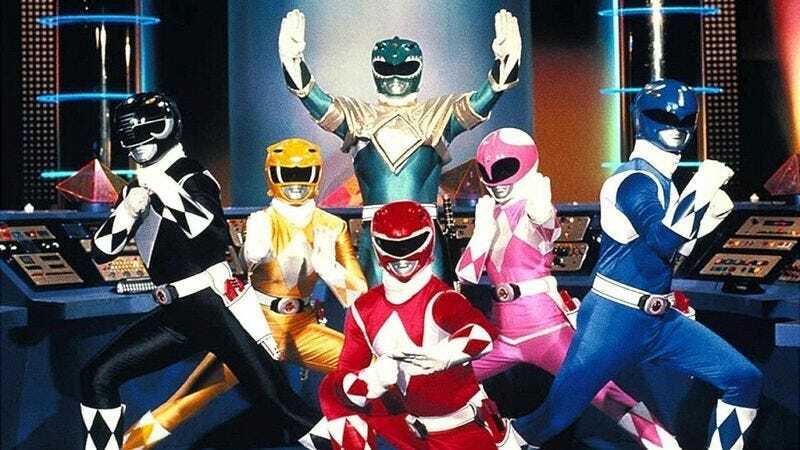 Since the original series debuted in 1993, Power Rangers has exploded into a bona fide cultural juggernaut, spawning 20 different TV shows and amassing billions of dollars in merchandise sales. If you have yet to immerse yourself in this wildly popular teenage superhero franchise, this primer will give you everything you need to know to hold your own in conversation. Most of the action sequence footage in Mighty Morphin Power Rangers was repurposed from the Japanese series Colorful Boys Defeat Christianity: Fantastic Yes! : Creators of the original American series were able to cleverly dub their own storylines over existing footage from a Japanese sitcom, transforming a show about colorfully suited astro-assassins maniacally obsessed with slaughtering God and all of his heavenly minions into a show about five teenaged martial artists working as a team to fight evil. The Rangers can combine their Zords together to form an extremely powerful dishwasher: In the Power Rangers universe, each of the Rangers pilot their own individual battle vehicles called Zords, and when facing a particularly formidable foe, they will assemble their Zords into a single unified mega-dishwasher that can blast dirty dishes and silverware clean with exponentially greater force than any commercially available dishwasher model. The Rangers’ enemies would be so intimidated by the mega-dishwasher’s extraordinary cleaning power that they would often concede defeat upon first sight and voluntarily turn themselves into the police. Zordon, the talking head floating in a glass cylinder who serves as the Rangers’ mentor, was eventually phased out of the series after viewers grew uncomfortable with how he was constantly begging the Rangers for chips: In every episode of the first six seasons of Power Rangers, there would invariably be a scene in which, after issuing the Rangers their mission for the day, Zordon would pitifully beg the teenage superheroes to climb inside his hyperbaric suspension chamber to feed him some potato chips, saying things like, “Rangers… bring me Ruffles now or I will kill myself,” or “I haven’t eaten in 20,000 years… Please come pack my face with Cheddar & Bacon Tato Skins… I am insane and I need chips.” If this weren’t already upsetting enough for children, the last straw came during a 1998 Power Rangers In Space episode in which Zordon enlists the ghost of Harriet Tubman to join him in his cylinder and begs her for chips, too—a cameo that critics widely agreed was incredibly inappropriate. The Zordon character was discontinued shortly thereafter. The Power Rangers can never stay morphed long enough to dry-clean their uniforms, so everyone smells nauseatingly bad: Never is this more evident than in the Mighty Morphin Power Rangers season two finale, when, in a dramatic ultimate showdown with archnemesis Rita Repulsa, the Rangers’ intensely sour odor becomes so overwhelming that Repulsa collapses to the ground and projectile-vomits for 12 consecutive minutes, allowing Green Ranger Tommy ample time to sneak up from behind and decapitate her. Every episode of the show includes a positive pro-morphin’ message for kids: More so than perhaps anything else on television in the past two decades, Power Rangers has consistently promoted the message that not only is it okay to morph, but that morphin’ is actually something that should be celebrated and done with great pride. In the early days of the franchise, this was an especially progressive stance to take, as other popular shows of the ’90s, such as Eek! The Cat and Suddenly Susan, commonly promoted decidedly anti-morphin’ themes.